A staff of five lines connected at the left end by a symbol; this symbol contains an arrow which points to the fourth line, indicating that that line is middle C (C4). This clef is sometimes used for the notation of the tenor part because it facilitates the printing of the part with minimal use of ledger lines. 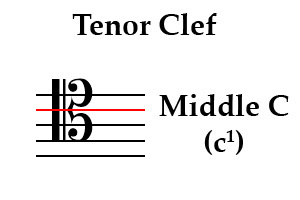 The tenor clef is one of the C clefs. The tenor clef should not be confused with the vocal tenor clef which is a G clef. The vocal tenor clef adds the number 8 below the normal G clef symbol indicating that the indicated staff should be performed one octave lower than indicated.